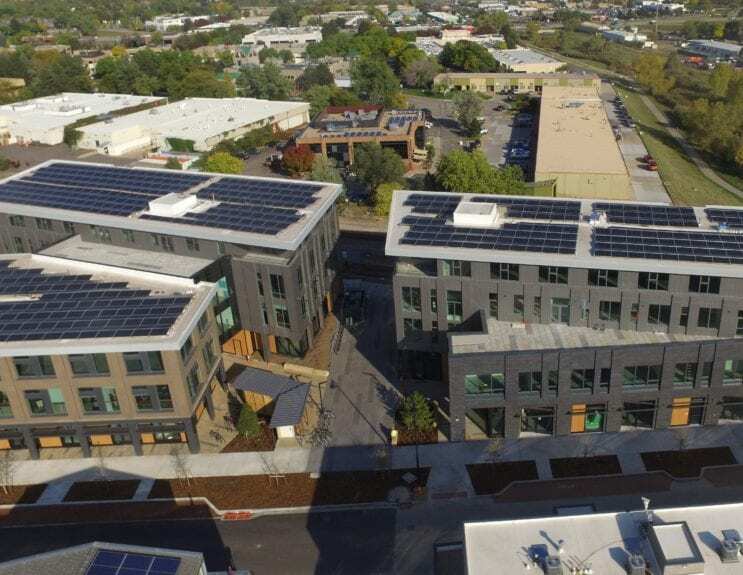 Boulder Commons is the first Net Zero Energy-leased development in the metro area. Boulder Commons will be discussed at the April 26 Sustainability conference sponsored by CREJ. NZE, or more precisely Net Zero Energy, leasing is the final panel at the Sustainability: Achieving the Next Level conference sponsored by the Colorado Real Estate Journal. You will want to stay for that panel, even if you don’t qualify for the four hours of continuing education credit. The half-day conference, CREJ’s principal Green Building event of the year, will be held from 12:25 p.m. until 4:45 p.m. April 26 at the Hyatt Regency Aurora-Denver Conference Center. The sustainability conference will follow the morning C-PACE conference, also sponsored by CREJ. 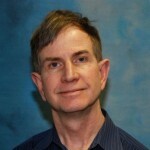 Sustainability for commercial buildings will be the topic of an April 26 conference sponosored by CREJ. The sustainability conference is expected to draw more than 200 building owners, brokers, property managers, architects, engineers, consultants and others. A NZE building is one with zero net energy consumption. In other words, a NZE building creates on site roughly the same amount of energy it uses each year. The next step in the evolution of a NZE building is the NZE lease. When you think about it, there has been a bit of a disconnect in NZE buildings, the top of the food chain for sustainable buildings, as far as the benefit-reward. The developer/owner spends the money either upfront or in retrofits for things like solar panels, extra insulation, plenty of natural light and energy-efficient light fixtures, to make the building as sustainable as possible. But it is the tenant in many buildings that reaps the reward of a NZE building from lower operating costs – and frankly, happier, healthier and more efficient workers. Two people from the Rocky Mountain Institute – architect Victor Olgyay and associate Alisa Peterson – will delve into the best practices for NZE leased buildings. 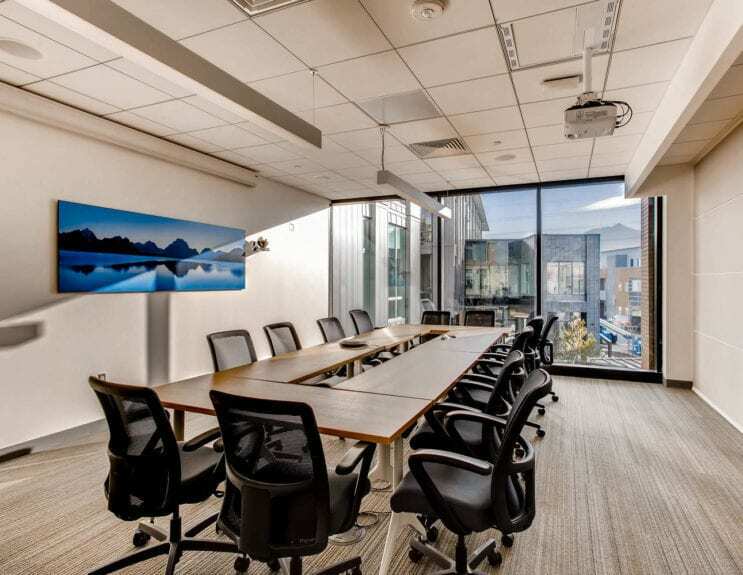 Natural light is an important component of an NZE buidling as this conference room at Boulder Commons illustrates. They will address the business case for pursuing NZE leased commercial properties for landlords and investors, as well as the competitive advantage for tenants. They also will detail how to approach an NZE lease agreement that benefits both landlords and tenants while meeting stringent NZE goals. While there are not that many NZE leased buildings in the nation, Colorado is fortunate to have the Boulder Commons development. Boulder Commons is a 100,000-square-foot, mixed-use development at 2440 and 2490 Junction Place, just north of the transit center at Boulder Junction. It is 2 miles from downtown Boulder. Boulder Commons, developed by Morgan Creek Ventures, is a two-building development that includes office space, restaurant, a coffee shop and a community gathering space. 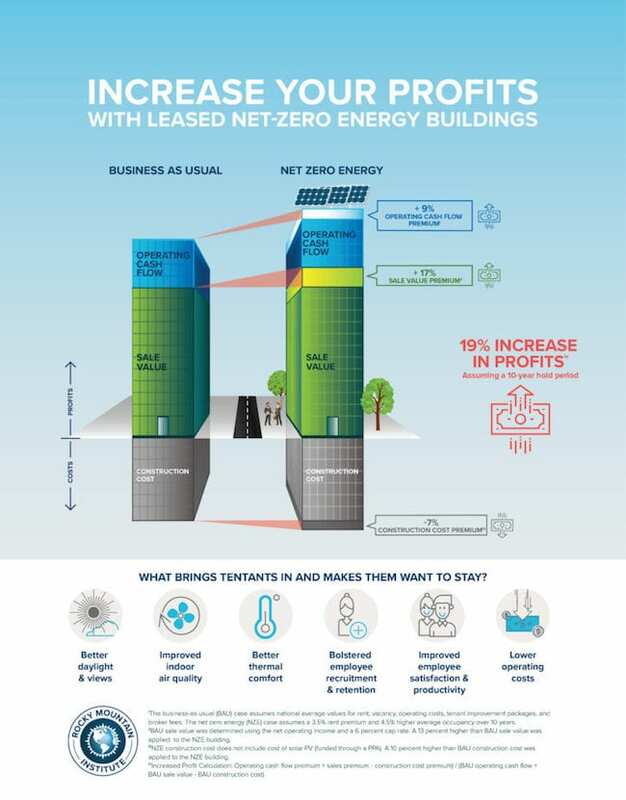 This infographic from the Rocky Mountain Institute shows how a building owner can profit from sustainable buildings. The Rocky Mountain Institute is an anchor tenant at Boulder Commons, taking 14,000 sf of space. “We love it,” said Cara Carmichael, a manager at RMI who was going to be a panel member at the CREJ sustainability conference but had to drop out because of a conflict. “We are so proud to finally be in a bulding that reflects our value and where we can bring clients and donors alike to show them what the next era of buildlings should look like,” Carmichael said. But she is sure that more NZE-leased buildings will follow. The development leverages state-of-the-art sustainability features to achieve the goal of NZE. The buildings are designed for optimal light penetration, which reduces the lighting load and overall energy usage while maximizing views and daylight for employees. Additional energy is harvested by solar panels that line the roof and east building facades. Of course, the NZE panel is not the only reason to attend the sustainability conference. “Hot topics” including where LEED certification is headed and a look at Arc, a state-of-the-art platform that collects, manages and benchmarks data to improve sustainability performance. Zachary Owens – program manager, Transportation Fuels and Technology, Colorado Energy Office.